Here is a project which started for me as an effort to develop a drag and drop object for possible use as a GUI element, or in a game. 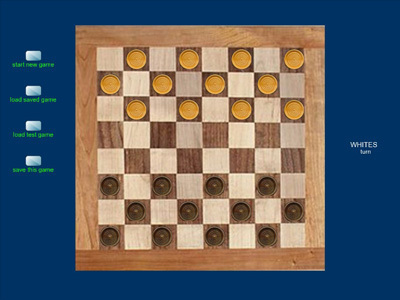 A checkers game with checkers which snap-to a board space center on release seemed like a good framework for developing the drag and drop object. SFML version 1.6 is used here. A checker will only snap-to a space if a move there is legal, otherwise it snaps back to where it was. 1) An animated greeting. (WELCOME appears, then after a couple of seconds it expands and fades out). 2) A fully animated dealing of checkers to the board. 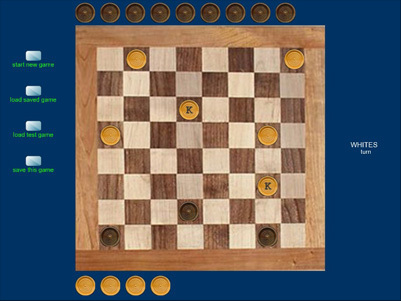 3) Captures, including the split of a captured king into two checkers where captured checkers go, along the board edges. 4) A captured checker is used when a checker is "kinged". 5) Animated winner announcement at end of game. A link to all source code, images and an executable (so you can try it out right away) is given at the end of this article. Here is a partial description of the source code. This class is abstract because the shape (round, rectangular) is to be indeterminate in the base class. virtual void snap(void) = 0; // carries out snap-to motion in frame logic. Shape dependent. Some of the data members hint at how the object works. static float snap_speed; // all common speed. Actually, snap_speed is not in use yet! Snap motions currently occur "instantly" (entire distance in one frame). Try enabling this feature! std::pair<int, int>* p_anchorPos; // array of allowed destination points in drag op. The array pointed to is declared statically in main.cpp and represents all of the 32 places where a checker can be on the board. The arguments passed to the release() function provide a list of "prohibited" anchors. If the dragDrop is released over one of these it will return to the homeIdx anchor. this application. The reader is therefore invited to create and utilize a dragDropCircle object. In dragDropRect we have just int szX, szY; and definitions for the 3 pv functions in dragDrop. Again. the intent with setting up an abstract base is to allow freedom of the path shape. In this project I added only one derived class. A linLeg supports motion in a straight line between 2 given points at a constant speed. This is the only type of motion used in the game. There is only one dragDropRect object in use in the game (chObj). This is the checker being moved. This class is for managing the use of multiple Legs. The class owns the array of Legs which objects may travel on. Path wh_dealPath( 12, 50, 3, 400.0f, -40.0f ); // 12 linLegs. One for each checker on deal. In main.cpp you will find these functions which provide the logic in the program. void gameLogic(void); // called in main(). Logic branches from here. void gameCapture_SplitAniLogic(void); // specific for capture and checker split (captured king into 2 normal checkers in the capture pool). void menuHitUp(void); // event handling for the buttons. You will also find button classes, as I tend to do all gui myself. I hope the above description gives you enough to base an understanding of the code upon. There are plenty of areas where the program could be extended and/or improved so there is room to tinker. I have improved over the last version of this article. The .zip file linked to below includes all source code, all images used, and an executable file which is now statically linked to the SFML libraries used. The exe should run without any external library files present.